The screenplay was adapted and based on playwright Noel Coward's 1935 short one-act (half-hour) stage play Still Life. It was expanded from five short scenes in a train station (the refreshment tea room of Milford Junction Station) to include action in other settings (the married woman's house, the apartment of the married man's friend, restaurants, parks, train compartments, shops, a car, a boating lake and at the cinema), although the film still maintains chaste minimalism. Lean's earliest co-directorial effort was for Major Barbara (1941) with Gabriel Pascal - a film adaptation of George Bernard Shaw's 1905 social comedy. This simple, poignant 'womens-type' film was positioned between his classic war film In Which We Serve (1942) and his later epic films, including The Bridge on the River Kwai (1957), Lawrence of Arabia (1962), and Doctor Zhivago (1965). 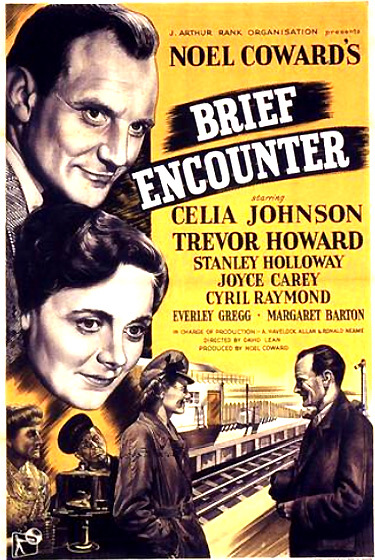 The film was nominated for three Academy Awards: Best Actress (Celia Johnson), Best Director, and Best Original Screenplay (Noel Coward, David Lean, and Anthony Havelock-Allan), and won the major prize at the first Cannes Film Festival. This was Lean's first nomination as director - notably, he was the first British director to be nominated for an Academy Award. Touching, emotional, accessible and realistic performances are delivered by the two main, middle-aged characters, although both lack charismatic star quality. The film ends on a bittersweet, unhappy note when the couple realizes that their chaste romance is over. The two lovers never consummate their romantic involvement by sexual relations (at least on-screen) in the bedroom. The narrative of the film is coherently communicated through voice-over flashbacks of the female character's emotionally-fraught memories that link the various scenes together. Her voice-overs are richly nuanced by her emotions, despair, imagination, remorse, and happiness - by all of her romantic feelings. In fact, at one point, she is in the physical presence of her husband, imagining that she is telling him about her affair - but in actuality, she is only speaking to herself. Throughout the film, she smoothly shifts from her role as a suburban housewife (and mother), to a hopeful woman who is excitedly on the verge of romance, to a self-analytical, reflective individual who painfully looks back in hindsight on the entire affair and responds to her full range of emotions. As the credit sequence illustrates, the film is about the scheduled, routine comings and goings, appointments and meetings, and arrivals and departures within structured, ordinary, everyday life. An express train whistles and crosses from left to right as it passes through the Milford Junction train station, sending up billowing steam and generating wind as the credits play to the musical score of Rachmaninoff's Piano Concerto No. 2. [Rachmaninoff's music plays over many of the film's scenes to emphasize their lyrical emotionality.] At the end of the credits, another train comes from the opposite direction, moving from right to left across the screen. The passage of the trains on different tracks clearly represent the lives of the two protagonists whose lives ultimately move, without romance, in different directions. The pensive couple, two middle-class people, doctor/general practitioner Alec Harvey (Trevor Howard) and mournful-eyed housewife Laura Jesson (Celia Johnson) are deep in conversation. [The meaning and significance of their situation - as unrequited lovers who are soon to separate - is not understood on first viewing.] The hostess' last unfriendly quip to Godby wryly criticizes his unreliability in their own imagined affair: "Time and tide wait for no man, Mr. Godby." The seated couple are interrupted by an overbearing, matronly gossip Dolly Messiter (Everley Gregg), who recognizes Laura and joins them for a cup of tea after a day of shopping ("I've been shopping till I'm dropping"). She intrudes unexpectedly, garrulously dominating the conversation until it is time for Alec to abruptly part to catch his 5:40 train to Churley ("I go in the opposite direction"). Dolly spoils their final few, painful moments together, forcing their farewell to be brief and offhandedly deceptive. When he rises to leave, he lightly places his hand on Laura's cloth-coated shoulder and then departs. As Dolly continues to chatter, put on makeup, and then order chocolate, Laura's sullen and drawn face reveals upset. She momentarily disappears (just before an express train roars through the station), and then returns in a distressed state, standing at the doorway of the tea room and explaining: "I just wanted to see the express go through." Well-meaning, Dolly buys and offers a faint Laura a 10 pence sip of brandy for her ill-health. Dolly: Well, he certainly was very good-looking. Dolly: Well, your friend, Doctor whatever his name was. Laura: Yes, he's a nice creature. Dolly: You've known him long? Laura: No, not very long. I hardly know him at all really. Dolly: Fancy him going all the way to Africa. Is he married? Laura: Yes. Two boys. He's very proud of them. Dolly: Is he taking them with him, his wife and children I mean? Laura: Yes, yes he is. Dolly: Well I suppose it's sensible in a way, rushing off to start anew in the wide open spaces and all that sort of thing. But, ha, ha, wild horses wouldn't drag me away from England and home and all the things I'm used to. I mean, one has one's roots after all, hasn't one? Laura: Oh yes, one has one's roots. I wish you'd stop talking. I wish you'd stop prying and trying to find things out. I wish you were dead - no I don't mean that. That was silly and unkind. But I wish you'd stop talking. This can't last. This misery can't last. I must remember that and try to control myself. Nothing lasts really. Neither happiness nor despair. Not even life lasts very long. They'll come a time in the future when I shan't mind about this anymore. But I can look back and say quite peacefully and cheerfully how silly I was. No, no I don't want that time to come hither. I want to remember every minute, always, always to the end of my days. Laura (crying into a handkerchief): Nothing really, it's nothing. Fred: Darling, what's wrong? Tell me please. Laura: Really and truly, it's nothing. I'm just a little run-down, that's all. I had a sort of fainting spell at the refreshment room at Milford. Wasn't it idiotic? Dolly Messiter was with me and she talked and talked...I wanted to strangle her...Isn't it awful about people meaning to be kind? Fred: You're a poetry addict. See if you can help me over this. It's Keats. 'When I behold, upon the night's starr'd face, Huge cloudy symbols of a high -------.' Something that's seven letters. Laura (immediately): Romance, I think. I'm almost sure it is. 'Huge cloudy symbols of a high romance.' It will be in the Oxford Book of English Verse. Fred: No, it's right I'm sure. It fits in with delirium and Baluchistan. Laura (getting up to put music on the radio): Would some music throw you off your stride? She first confesses the dynamic passion she experienced in her transformational escape from her ordinary routine, considered unusually climactic for an "ordinary woman." Narrated and told through a series of flashback memories (or subjective reveries) by the lonely country housewife, she feels trapped and circumscribed within a repressive social system and rebels against the limitations of life itself. Laura fantasizes and recalls the last few tumultuous weeks of her life while seated in the arm chair of her living room. Laura ironically confirms: "I'm a happily married woman." Fred, dear Fred. There's so much that I want to say to you. You're the only one in the world with enough wisdom and gentleness to understand. If only it was somebody else's story and not mine. As it is, you're the only one in the world that I can never tell. Never never. Because even if I waited until we were old, old people and told you then, you'd be bound to look back over the years and be hurt. And my dear, I don't want you to be hurt. You see, we're a happily married couple and let's never forget that. This is my home. You're my husband. And my children are upstairs in bed. I'm a happily married woman - or I was, rather, until a few weeks ago. This is my whole world, and it's enough, or rather, it was until a few weeks ago. But, oh, Fred, I've been so foolish. I've fallen in love. I'm an ordinary woman. I didn't think such violent things could happen to ordinary people. It all started on an ordinary day in the most ordinary place in the world - the refreshment room at Milford Junction. I was having a cup of tea and reading a book that I got that morning from Boots. My train wasn't due for ten minutes. I looked up and saw a man come in from the platform. He had on an ordinary Mack, his hat was turned down and I didn't even see his face. He got his tea at the counter and turned. Then I did see his face. It was rather a nice face...He passed my table on the way to his...Oh please, could you give me a glass of water? I've got something in my eye and I want to bathe it. That's how it all began, just through me getting a little piece of grit in my eye. I completely forgot the whole incident. It didn't mean anything to me at all. At least I didn't think it did. Laura: Perfectly all right. How kind it was of you to take so much trouble. Alec: Nothing at all. It's clearing up I think. Laura: Yes, it's going to be nice. Alec: Well, I must be getting along to the hospital. Laura: Now I must be getting along to the grocers. Alec (wryly): What exciting lives we lead, don't we? On a third weekly trip to town, Laura is expectant about meeting Alec again, but doesn't. Alec: Oh, good morning. Are you all alone? Alec: Would you mind if I shared your table? It's very full. There doesn't seem to be anywhere else. Laura: No, of course not. Alec: I'm afraid we haven't been introduced properly. My name's Alec Harvey. Laura: How do you do? Mine's Laura Jesson. Laura: Mrs. You're a doctor, aren't you? I remember you said so that day in the refreshment room. Laura (speaking about musical talents): After all you know, I might have tremendous, burning, professional talent. Laura: Why are you so sure? Alec: You're too sane and not complicated. Laura: I suppose it's a good thing to be uncomplicated, but it does sound a little dull. Laura: Do you come here every Thursday? Alec: Yes, to spend a day at the hospital...Do you? Alec: Come here every Thursday? Laura: Oh yes. I do the week's shopping, ... change my library book, have lunch, and generally go to the pictures. Not a very exciting routine but it makes change. Alec: Are you going to the pictures this afternoon? Alec: Hmmm, how extraordinary! So am I..
Laura: I thought you had to spend all day at the hospital. Alec: Well, between ourselves, I killed two patients by accident this morning...I simply daren't go back. Laura: Can you be so silly? Alec: Seriously...Would you mind very much if I came to the pictures with you? Alec: I could sit downstairs. You could sit upstairs. ...I had no premonitions. I suppose I should have had. It all seemed so natural and so innocent.